You may have heard this mentioned in a health, holistic or medical context, but what actually are the body’s meridian lines? To put it simply they are the energy network of the body; the lines are the channels by which our energy flows, thus transporting said energy throughout the body. Our life energy – also known as Chi or Qi – distributed by these channels is not exactly a physical system like the circulatory system, it is better understood as being a process as opposed to a structure. This process is studied by Chinese medicine practitioners as intently as a western doctor would have to study the anatomy of the human body. Any blockages in this system may be caused by stress, bad diet, drug or alcohol abuse, injury, trauma, etc. and can be related to the cause of all health issues. It is strongly believed that this energy flow conditions our overall existence; how we think, how we feel, how our body moves. Everything. Throughout the body lies many ‘Yin’ and ‘Yang’ pairs; each Yin organ is paired with a Yang organ for example. From the chest area via the three arm Yin channels – lung, pericardium, heart – to the hands. 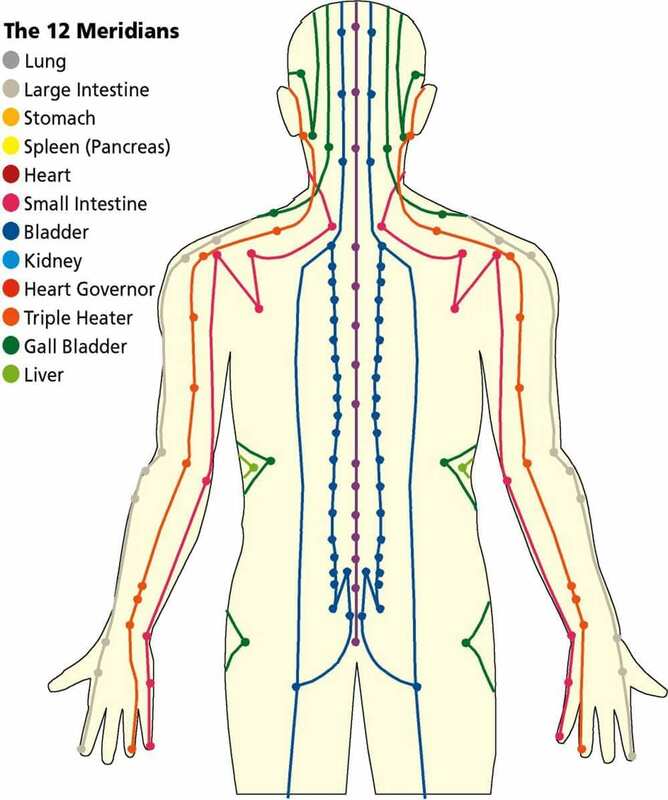 From here we connect with the three paired arm Yang channels – large intestine, San Jiao, small intestine – and flow up to the head. From the head we connect to three corresponding leg Yang channels – stomach, gall bladder, bladder – and flow to the feet. From the feet we connect with the corresponding leg Yin channels – spleen, liver, kidney – and flow back to the chest to complete the energy circle. The arm and leg channels of the same name communicate with one another within Chinese medicine. Therefore if there is an issue with a particular channel or organ, these problems can be addressed by treating various points on the corresponding partner. As well as the twelve primary channels there are also the ‘Extraordinary Meridians’. These have specific functions yet are not linked directly to the organ channels, though they do provide further connections between them. They act as reservoirs for energy and blood regulated as and when required by the primary channels. the meridian system of the human body is a delicate, yet intricate web of interconnecting energy lines. If a person masters an understanding of this meridian system they will know the secrets of the flow of Qi energy in the body. Our body needs to be at peace, if you like, to be in a state of harmonious balance within its Yin and Yang forces. If balance is disrupted and becomes off kilter then illness can manifest. In order to utilise acupuncture for healing a doctor must know exactly where to access the energy points and release any blockages or surplus energy which may be causing an imbalance. Meridian massage therapy and Acupressure are also methods in which to restore this essential equilibrium and therefore aid good health. As well as physical health there is a demonstrable link between the Meridians and our emotional well being. There are psychotherapeutic treatments, psychotherapies and counselling techniques whereby repressed emotional trauma can be alleviated by tapping into the Meridian flow of the body. Here at the School of Natural Health Sciences we offer a distance learning diploma course of 12 lessons in Meridian Psychotherapy – accredited in 26 countries worldwide. The course focuses upon practical meridian therapy applications that can be learned and practised by the student, either as a stand alone therapy in its own right or as part of a practicing therapist’s “tool kit” of effective techniques.